A big day for koalas, because finally we have a decision. A decision that will compound local government and infrastructure planning challenges and radically alter property development in Queensland in particular, but a decision that will nevertheless provide a last chance for our dwindling koala population. Koalas in NSW, Queensland and the ACT will be classified as vulnerable under a protected listing by Federal Environment Minister Tony Burke. Mr Burke says koala numbers have dropped by 40 per cent in Queensland and by a third in NSW over the past two decades. The koala will be listed as vulnerable on the threatened species list following advice by the Threatened Species Scientific Committee. Mr Burke said developers will have to account for the koala listing when making building applications. The Senate enquiry into the status, health and sustainability of Australia's koala population heard during its submissions, that the future conservation status and management of Australia's koalas is dependent upon accurate estimates of koala populations. The Property Council submitted that any decisions made on the future of the koala population must be based on scientific estimates of the number of koalas. The Wildlife Preservation Society of Queensland suggested it was essential that koala populations are known. Reportedly the Federal decision to protect the koala had been consistently delayed because there was no nationally comprehensive or coordinated data on koala populations. But there is. It is KoalaTracker.com.au, and it is free. It is for this very reason: because no government agency or research body can say how many koalas are left, whereabouts and in what condition, Australia's first national crowdsourcing koala mapping website, now known as www.KoalaTracker.com.au, was created and launched in February 2010. Your humble reports of single koala sightings, however seemingly unimportant, are critical. Especially important are the reports pinpointing colony locations and the danger zones for car strikes and dog attacks, on which councils, developers and communities can, and now must take immediate risk mitigation measures. For all the millions of dollars spent on mapping vegetation (by pixel colour from satellite images) to determine no value, low value and high value koala habitat, it is the actual reporting of location intelligence from members of the community via this free crowdsourced database and map, that will provide the data essential to make informed development and infrastructure decisions. A significant amount of information has already been contributed by members of KoalaTracker from around the country, reporting location and situation of alive, sick, dead and injured koalas, with causes of death and injury, map coordinates, and with in some cases, spectacular photography. Almost 1,700 reports comprise a disturbing picture of isolated pockets of populations, the spread of disease, the impacts of urbanisation. No better example of the value of KoalaTracker.com.au to government authorities exists than the sightings diligently provided by the likes of KoalaTracker members, Lyn and Warren Truss. In addition, their photo album in the member’s section shows how the koalas have adapted to the housing that replaced their once lush koala food forest, using the koala-friendly fencing as freeways through the suburb of Tinana, south of Maryborough, to make the longer journeys between food trees. Sadly, for every three sightings reported by Lyn and Warren, there seems to be a death or injury report from Ray and Murray Chambers of Sunshine Coast Koala Wildlife Rescue for the same area. 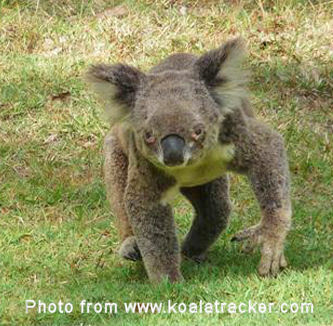 Ray and Muz are active members of KoalaTracker, and sign each of their sighting reports, sckwr. I urge you to do a database search on the keyword, sckwr, to see the incredible effort these two men put into saving our koalas. You can find a link to their website and other resources on our links page. We must reverse the trend of rapid population, health and genetic decline in the koala colonies that remain, not just because we love the koala as an iconic wildlife emblem of Australia, but because it makes good financial sense to do so. The 1997 study, Koalas and Tourism: An Economic Evaluation, asked departing foreign tourists which animals they had wanted to see in travelling to Australia. Seventy five per cent of inbound tourists said that they hoped to see a koala. When asked whether they would have changed their decision to come to Australia if there were no such unique wildlife, 11 per cent said ‘yes’. It is this figure - the potential loss - that formed the upper bound of direct correlation to the economic contribution of koalas to the Australian tourism industry. In 1996, inbound tourism revenue was $16.1 billion. Report author, Dr Clive Hamilton rightly suggests that koalas might be thought of as an input into the tourism industry for which tourism operators do not pay. In the financial year 2008–09, tourism directly employed ~half a million people, contributed 2.6% ($33 billion) of our GDP, and inbound tourism generated $24 billion. If koalas were worth $1.1 billion to the Australian tourism industry 15 years ago, what could they be worth now? The fate of the koala is as much an economic decision as environmental. It requires national policy and urgent action from all levels of government, all sides of politics, from the tourism industry and the community. To this end, I call upon the federal, state and local governments to come together with public forums in urban and regional centres that have resident koalas, in which we can all participate to give voice to the plight of the koala, and provide input to planning decisions that protect the koala. Please forward this email to your local state member of parliament, your council and federal representatives, your tourism and property industry representatives and friends, asking for a public forum to be held in you area. This email will be added to KoalaTracker.com.au as a blog post, and I invite you all to add your comments in support. And keep those reports coming. Every sighting counts. Tell your friends. Lastly, sincere thanks to the many members (well over 100 at last count) who sent emails in support of KoalaTracker (previously known as KoalaDiaries) continuing, and to so many of you for making good use of the site - a further 30 sightings were reported and as many new members have joined in just the past few days. Remember to change your bookmarks and links on your own websites to www.KoalaTracker.com.au, and tell your friends to join too. Campbell Newman, the new Premier (winner of recent Murdoch 2 horse race) is a reactionary who pushes 'development' at any cost. ( Seems to be all he knows). Koalas won't survive this attitude. "Mr Burke has said developers will have to account for the koala listing when making building applications". This will cause delays to developers, but it is unlikely to actually stop tree clearing. If koalas are living in the area to be "developed", then where can they go? Loss of suitable habitat is the threat, along with dogs, roads, trees further and further apart. Then they are blamed for their own demise by "over-browsing"! Delaying the inevitable is about moving deck-chairs on the Titanic, not solving the problem. 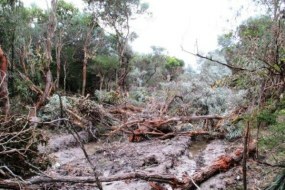 Land clearing and destruction has caused havoc in Australia since European settlement. Since European settlement, approximately 80% of Australia's eucalypt forests have been decimated. The eucalyptus forests and woodlands of Australia’s east coast are disappearing quickly, with a significant loss occurring throughout our local area. Continued clearing eventually leads to koala populations being isolated in small, fragmented parcels of land, totally cut off from other populations and extremely vulnerable to dog attacks and motor vehicle accidents. A NSW north coast conservation group says the State government has been 'lying' about the illegal logging of koala habitats. The council has repeatedly claimed to DECCW that there is core koala habitat; this is mapped core koala habitat, and flagging that they should not be issuing logging approvals there," a spokesperson said. "But the department has just carried on and it's issued some 50 approvals, of which at least 80 percent we believe are in core koala habitats." While money is to be made from land clearing and rates, corruption will abound. Koalas live in societies, just like humans, so they need to be able to come into contact with other koalas. Because of this they need to have areas of suitable eucalypt forest which are large enough to support a healthy koala population and to allow for expansion by maturing young koalas. Unless Minister Tony Burke "draws the dots" between a sustainable human population, and the protection of even iconic native animals such as wild koalas, then any changes to the status of koalas are welcome, but insufficient against aggressive human population growth.